Golden Eagle Coaches started in business in 1926. Peter Irvine, the founder and grandfather of the present owners, like most of the workforce in this part of Lanarkshire, was a miner. This being the year of the general strike in this country, and having a wife and family to support, he gathered all the family savings and bought a 14 seater bus. 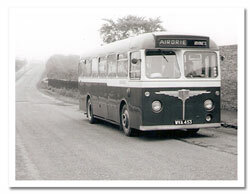 As no special licence was needed in those days, he immediately started carrying passengers between Salsburgh and Airdrie. A small garage was built on part of the present site. Like all new businesses things did not always run smoothly, like the day a driver lit a match as the bus was being filled with petrol, setting the whole thing alight. It took a year to gather enough money to start up again. 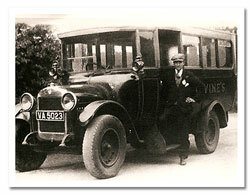 In 1935 Peter Irvine bought his first coach. He could now expand from service work to taking people on tours. He decided the business needed a name and so Golden Eagle Coaches was born. Prior to this he traded under the family name Irvine's. 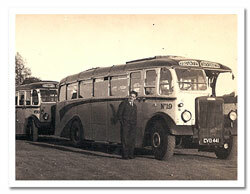 From then on he built up his business, adding more buses and coaches as time went on until in 1939 when the Second World War broke out. The government commandeered three coaches to be used for moving troops around the country. These were not given back until the end of the war in 1945. Starting in the 1950’s coach tours travelled as far as France and Switzerland via Dover. 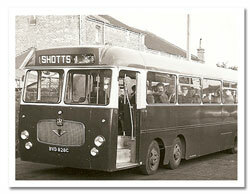 Golden Eagle was the first company in Scotland to have a coach cross the channel. 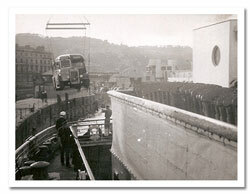 In those days there were no roll-on/roll-off ferries and the coach had to be hoisted on board by crane. 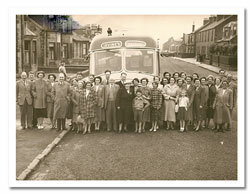 Business carried on as usual till in 1960, when Greenshields, another bus firm from Salsburgh, was bought over by Golden Eagle Coaches and the service was extended to run between Shotts and Airdrie. Over the years, the premises has been developed and now includes an MOT station, a wash bay and a repair shop, where all the vehicle maintenance is carried out. Peter Irvine died in 1956 and the running of the business was carried on by his youngest son John, who in turn after his death in 1996 has left Peter, Robert and Ishbel in charge. Today they run the business along side Iain Peacock whose input has been an invaluable contribution to the company.